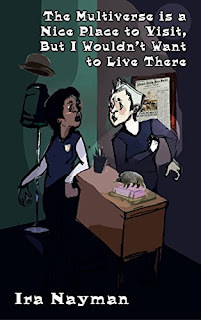 Nayman’s novel blends the elements of a police procedural with madcap humor and imaginative characters and locales. Along the way, we’re treated to oddities like talking furniture, a combination hovercraft/coffee maker, anthropomorphic animals who dress up as humans (they call themselves “skinnies”), and an alien species called the Big Bam Boo. As the Transdimensional Authority agents begin the painstaking process of data-gathering and interviewing witnesses, the reader is treated to humor that leaves no stone unturned. Scientists, the theatre, politics, social interactions, relationships, popular culture—everything and everyone is fair game for Nayman’s wit. Nayman makes use of hyperbole; for example, “One of Davros’ raised eyebrows contained more information than two and three quarters volumes of Proust” (60). In other spots, the humor is more subtle: “at the far end is the medical annex, which includes EEGs, EKGs, MRIs and CAT and DOG scanners” (22). When the Stratford production from which the three actors mysteriously disappeared closes down as a result of the ensuing confusion, the headline reads “Twelfth Night Closes On Third Day” (73). Nayman employs absurdity to good effect. A pair of Transdimensional Authority investigators, when asked to give a password at a door manned by a person, are told they will get “locked out for an hour” after three unsuccessful tries (235). In another spot, Transdimensional Authority investigator Beau Beaumont is described as looking “so confused he could spit a rhinoceros” (240). Writers are often exhorted to avoid trite and tired metaphors. There’s no fear of that with Nayman, who has a knack for giving old expressions a new twist, as in these examples: “the old woman gave her a look that could curdle milk that wouldn’t be taken from the cow for at least three weeks” (134); “Biff Buckley ran with the idea. Towards his own end zone, but still” (217); and “Noomi was so on edge she was afraid she would cut herself” (105). The Multiverse is a Nice Place to Visit… is liberally sprinkled with references to popular culture. Comments like “A towel won’t help you here” (19) give a nod to Hitchhiker’s Guide to the Galaxy, and the skipper of the Star Blap, Captain James T. Pompous, calls to mind Captain James T. Kirk from the original Star Trek series. Dr. Oz, Mel Blanc, and Jack Ryan are among other figures who find a mention in the book’s pages. Understanding Canadian culture is by no means a “must” in order to enjoy this novel, but those with such knowledge will note Nayman’s mentions of the Stratford Festival, Margaret Atwood, Nathan Phillips Square, Celine Dion, and Tim Hortons, as examples. Though references to pop culture are salted throughout, the story is not exclusively rooted in Earth-side phenomena. One of the more memorable characters is a “Big Bam Boo” named Blarcch Beletchian. The grey-skinned Big Bam Boo are a highly intelligent “humanoidish” (38) race with tentacles instead of arms and legs. Their language consists “of words of one syllable or less” (38), which creates an opportunity for misunderstandings when Beletchian applies his innate linguistic biases to English by pronouncing multi-syllable words as though each syllable were an individual word. Nayman sets up ongoing tension between Beletchian and his human Transdimensional Authority partner Bao Bai-Leung. The latter interprets Beletchian’s tendency to want to pat him on the head with his tentacle as being condescending—which perhaps has some foundation, since later in the book Beletchian hints that he views Bao Bai-Leung as a “petner” (257) as much as a partner. Bao Bai-Leung’s increasingly agitated efforts to fend off Beletchian provide Nayman with some opportunities for slapstick humor. Some of the humor simply provides entertainment value, while other sections pack a satirical bite based on Nayman’s observation of human nature. One of my favorite sections in the book comes when Xenia Zaifman addresses a male-dominated group of colleagues. To make sure the message gets across, she’s accompanied by Clement Cadell, whose role is “translating what Xenia [says] into Masculinese” (124). For example, Xenia says, “Hello, everybody!” (125) and is met with silence. Clement repeats her greeting and the guys respond with “‘hellos’ and ‘hiyas’ and the stray, ‘greetings, Earth alien’” (125). As she provides her explanations, Xenia makes observations that are perfectly understandable, only to be met by confused looks. Clement offers a two-sentence summation and everyone nods. It’s as though the most of the men don’t really hear what Xenia is saying until the idea is repeated or rephrased by a man. This segment of the book, though written in satirical style, has at its core a type of experience that might seem eerily familiar to some readers. “Will this hurt?” Dr. Richardson asked. “Good science always hurts,” Doctor Alhambra told him, grinning, and reached for the switch. Elsewhere, Nayman slides in observations about relationships, workplace dynamics, and our interface with technology that hit close to home, such this observation: “Ever since she got her first laptop when she was seven, Noomi had always found computers to be a bit smug, as if you served them rather than the other way around” (146). Though humor is at the core of the novel, Multiverse also has concepts that hold it together. One such concept is that of the multiverse itself, which “contains an almost infinite number of universes, universes that branch off from each other at various choice points throughout [history]” (76-77). Reference is made to Dimensional Portals, which provide a mechanism for travel between universes. Nayman even provides an explanation of how you arrive at the next universe at the same time you left the previous one (203). The explanations, though farcical, lend credibility to the story within its particular framework. All in all, I found The Multiverse is a Nice Place to Visit… an enjoyable read, although I found myself reading carefully rather than quickly so as not to miss any of the sometimes-subtle humor. I had just three minor quibbles. First, I found the opening chapter, in which Nayman depicts the first of the three scenarios of consciousness transference, to be funny but also convoluted and somewhat confusing. The pace picked up after that. Second, the book contains articles written by the “Alternate Reality News Service” interspersed with the text. As I read on, I understood the reason for the inclusion of these sections, but initially they seemed to me to interrupt the flow of the book. Third, there were a handful of spots where I felt a particular vein of humor or a particular scenario went on overly long, causing it to lose its impact. These were relatively minor issues, though. Overall, I found Nayman’s book entertaining, and the variety of types of humor and original turns of phrase kept things fresh. As a Canadian, I found the references to Canadian culture sprinkled through the book an added bonus. There were strong female as well as male characters, inventive and creative scene-setting, and some dead-on satire. The good news is that if you read The Multiverse is a Nice Place to Visit, But I Wouldn’t Want to Live There and like what you see, there’s more where that came from—Nayman has penned several novels that feature the Transdimensional Authority, as well as the Alternate Reality News Service and the Time Agency. And you don’t have to pop through a Dimensional Portal to access them—copies are readily available here on Earth Prime. Thanks for this thorough and well-written review. I know this writer and was present for his book launch at this year's CanCon and am happy that TFF reviewed it. I bought the book for my brother, but may be I should get it back from him and read it myself! Excellent, thoughtful review. I have the book by my bedside table and look forward to reading it... especially after this terrific review!